The creation of the Aunt Jemima trademark from an 1889 vaudeville performance of a play called "The Emigrant" helped codify a pervasive connection between African American women and food. 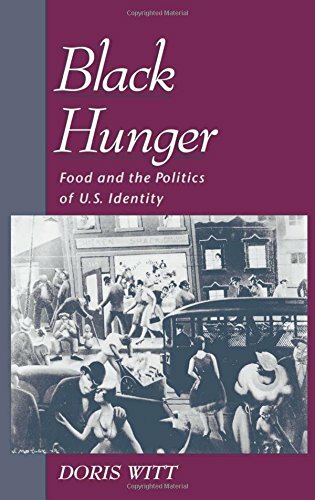 In Black Hunger, Doris Witt demonstrates how this connection has operated as a central structuring dynamic of twentieth-century U.S. psychic, cultural, sociopolitical, and economic life. Taking as her focus the tumultuous era of the late 1960s and early 1970s, when soul food emerged as a pivotal emblem of white radical chic and black bourgeois authenticity, Witt explores how this interracial celebration of previously stigmatized foods such as chitterlings and watermelon was linked to the contemporaneous vilification of black women as slave mothers. By positioning African American women at the nexus of debates over domestic servants, black culinary history, and white female body politics, Black Hunger demonstrates why the ongoing narrative of white fascination with blackness demands increased attention to the internal dynamics of sexuality, gender, class, and religion in African American culture. Witt draws on recent work in social history and cultural studies to argue for food as an interpretive paradigm which can challenge the privileging of music in scholarship on African American culture, destabilize constrictive disciplinary boundaries in the academy, and enhance our understanding of how individual and collective identities are established. If you have any questions about this product by Doris Witt, contact us by completing and submitting the form below. If you are looking for a specif part number, please include it with your message.